Oh boy, has spring been busy so far. Between renovations in the studio, a string of workshops and retreats, and trying to get in some spring cleaning around the house, sometimes I don’t know where to start! Last weekend I was up north with the Timmins Quilter’s Guild for their year-end workshop and this upcoming weekend I’m teaching Northern Neighbours for the Rayside Balfour Guild on Saturday and then headed to the Sudbury Guild’s year-end workshop for some Studio 180 fun on Sunday. I was a little nervous leading up to the workshop with the Timmins Quilter’s Guild. Usually, I worry about things like having a brain fart in the middle of a lesson or, if I’m working with more than one ruler or technique, I worry about saying one thing when I mean the other and confusing everyone. But this time, my worry was squarely focused on my SUV. You see, the back door has been giving me trouble. You could even say it’s developed a bit of an attitude. No matter what I do - pushing in while pressing the button, giving it a special jiggle, kicking from the inside, or simply heaving as hard as I can - sometimes it opens and sometimes it doesn’t. There’s never a guarantee that it’s going to cooperate. With the small mountain of quilting paraphernalia I travel with, this backdoor thing has proven to be a problem. Highway 144 - what a road! There’s no potholes or bad hills, it’s in good condition as far as northern Ontario highways go. But every turn looks like just the last – rocks and trees and trees and rocks. Eyeballs wide open looking for moose and dear and bears. I kept thinking, “Please don’t let me hit anything”. Have I mentioned the speed limit is 80km/hr? It’s not bad enough that it’s never-ending, you have to go at a turtle’s pace. And then there’s the transports. It’s not the widest road I’ve been on and it feels a lot smaller when the 18-wheelers fly past. Needless to say, three hours later I was in Timmins safe and sound. The guild had made arrangements for me to set up Friday evening in a classroom at the Timmins High and Vocational School. The lovely, helpful staff at the school escorted me to the room and everything was ready for me to set-up. I backed up to the loading door, went to open the back door of the SUV – nope! Not going to open. After tugging and heaving, pushing and pulling, I jumped in, drove in a circle in the parking lot, re-parked, and voila! The back door opened. I used to play a similar trick with a horse I had years ago named Apple. When she was mis-behaving, I’d walk her in a circle so that she’d forget why she didn’t want to do what I’d asked her to. Most of the time, it worked. Ok so…maybe my SUV is my horse reincarnated! The workshops on Saturday and Sunday were fantastic. The workshop was a little different than usual since one side of the room was working on the Northern Neighbours quilt and the other side was designing with the Studio 180 Hunter’s Star tool. With two workshops on the go, the results on Sunday were a feast for the eyes! One of the most unique and pretty Hunter’s Stars I’ve seen resulted from an ‘oops’ - accidents are an excellent source of creativity! The white and red really make the quilt pop! Here, the pink and blue blocks were arranged, unintentionally, into a brand new design. Thanks for a great weekend ladies! 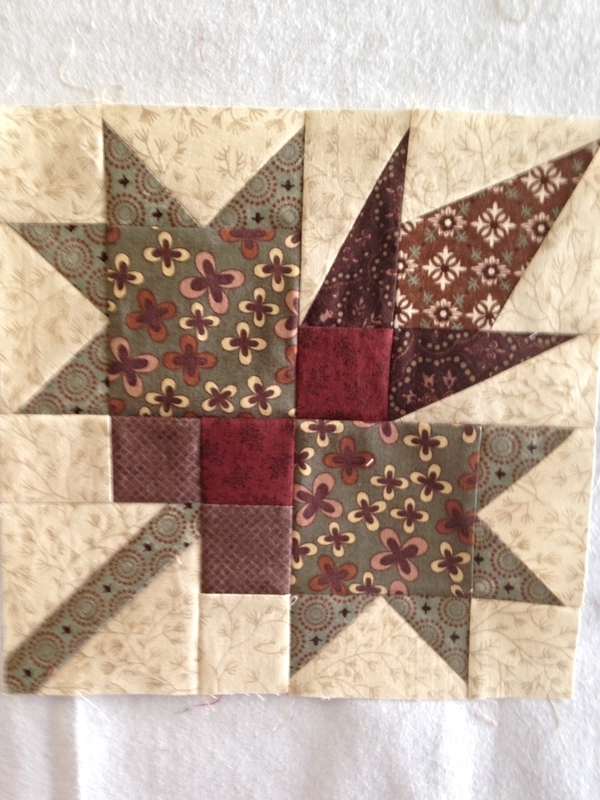 Another interesting design idea came from a quilter who was incorporating panel blocks into her quilt. The Northern Neighbours group were delighted with the precision of their points and how easy their leaf blocks came together. All were well on their way to finishing some beautiful quilts by the end of the weekend. I was particularly looking forward to touching base with a handful of quilters who I knew from about 10 years ago when I used to hold quilting retreats in Killarney. It was so nice to see them and get caught up with everyone. Quilting is truly like one big family! One of Kathy Issacson's quilts from the good old days in Killarney and her Westie, Spike. Sunday came to a close far too quickly as it always does. Packing up my first load of stuff, the back door opened on the first try - big sigh of relief! I slid in my big Rubbermaid trunk and a few large totes. But, returning with load two, my ornery SUV decided to be difficult and would not open. Pushed, pulled, banged, kicked, and drove around the parking lot to no avail. “Well, at least the big stuff got in”, I thought to myself. I wrestled the rest in through the back window and side door and headed home. I am happy to report that after too many workshops and retreats with a dysfunctional back door, a trip to the shop yesterday has finally fixed the issue. Please remember to send me photos of those finished quilts. I’m still working on getting the gallery together and I’d love to share the beauties you’ve all created. Thanks for dropping by and until next time, stay safe, watch for deer and other four-legged friends on the road, and keep on quilting!